Young people have typically been affected by Type 1 diabetes, an autoimmune condition affecting 10 per cent of diabetes cases. However Type 2 diabetes, a disease that was once considered to only affect older people, is now targeting a different age profile. Diabetes rates have doubled in the last 12 years and this increase is significantly affecting young women. This means that women are now living longer with the disease, and more women in their child-bearing years are being diagnosed, which could increase pregnancy complications. 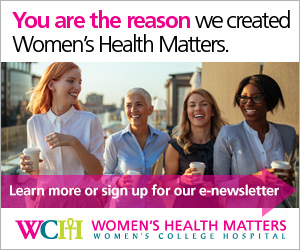 Dr. Lorraine Lipscombe, scientist at the Women’s College Research Institute and endocrinologist at Women’s College Hospital explains to Women’s Health Matters what has led to this increase, the risks that young women should be aware of, as well as the necessary precautions involved for pregnancy. Dr. Lipscombe agrees that this is especially true for diagnosis of Type 2 diabetes, the more common type of diabetes that typically affects people over the age of 35. The alarming increase in diabetes diagnosis among young women may also be partly due to more frequent doctor visits made by women in their child bearing years who are concerned about fertility and the steps to take before and during pregnancy. Dr. Lipscombe notes that some young women who are pre disposed to diabetes are being diagnosed more often in these situations. Type 2 diabetes risk increases with changes in lifestyle habits. Dr. Lipscombe lists the following factors that can influence a young woman’s predisposition to the disease. high-risk ethnicity, such as South Asian, Aboriginal, Latin American, and African. By taking the necessary precautions before pregnancy, women will endure fewer challenges during pregnancy and will also help reduce the risk of birth defects. The most recent trends in diabetes rates reinforce the notion that this chronic disease can target women in every age group. Dr. Lipscombe notes that young people can no longer assume that they are not vulnerable to Type 2 diabetes. “A lot of young people don’t think they are at risk of Type 2 diabetes,” says Dr. Lipscombe.